Blue Line Kids provides everything a kid needs to make their own Comic Books and Storybooks! Blue Line Kids are booklets are printed on quality premium grade paper with cardstock covers that are stapled and trimed. Sized perfectly for young hands. The card stock cover and non-photo blue panel guides make them easy to use and provide a great presentation for the work of young imaginations! Wonderful for home and classroom! Blue Line Kids Regular are Booklets for children to create their own complete comics and story books. Blue Line Kids Deluxe Kits. 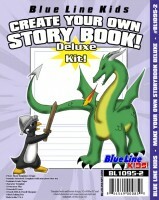 Blue Line Kids Deluxe Kits along with the booklets also includes art supplies.